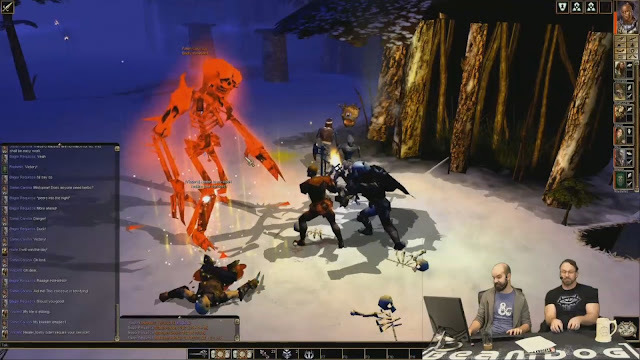 Beamdog CEO Trent Oster and Studio Director Phillip Daigle spoke about the future of Neverwinter Nights: Enhanced Edition, the 2.5 patch for the Infinity Engine games, and they also went in search of adventure on the Arelith EE Beta Persistent World for NWN:EE. 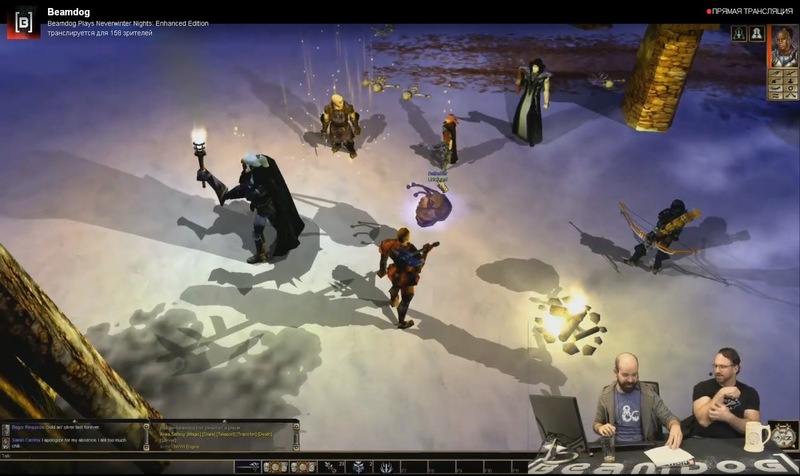 Players from around the world were able to join in during the stream to help seek out and destroy an undead Jarl that was menacing an icebound port town. 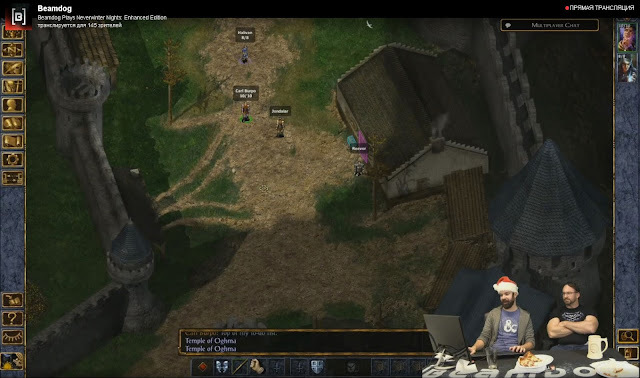 Later they switched to Baldur’s Gate: Enhanced Edition and explored Candlekeep in an open multiplayer test session with a lucky forum member, Doubledimas. Missed the stream? It's on YouTube and Twitch! If you still haven’t heard about it, Neverwinter Nights: Enhanced Edition Head Start is going strong. By pre-ordering the game from Beamdog and participating in the Head Start, players shape the future of NWN:EE. There’re 2 Trello boards for Neverwinter Nights: Enhanced Edition: the Roadmap board and the Input board. Grab the Head Start and on the Beamdog forums tell us what feats and features you want to see in NWN:EE, then vote on the Input boards for suggestions you prefer. We want to take the feedback from the players and let that feedback drive the development of the game. The whole concept of Neverwinter Nights: Enhanced Edition Head Start is to get it out early and let people tell us what features we should work on. If you look at the Input board, people vote there for the most wanted stuff. For example, people are really interested in new content for NWN:EE and getting upgraded character models. The new build for Neverwinter Nights: Enhanced Edition Head Start was released yesterday (v74.8153). Don’t miss the latest changes and check the patch notes here. Neverwinter Nights is famous for its Persistent Worlds. During this livestream we checked out a Persistent World that had been running for 13 years or so - the Arelith server. The people behind that server have already created the whole new custom module working for Neverwinter Nights: Enhanced Edition, and it shows in full detail what the NWN community can do. The Arelith server is one of the many. Head over to https://nwn.beamdog.net/ to find tons of servers already available for Neverwinter Nights: Enhanced Edition. Don’t forget that there’s also a galaxy of user-created modules available to play in NWN:EE today! Neverwinter Nights: Enhanced Edition will be released fully when it’s done. The release of BG:EE was rough, but the game has taken so many steps forward during more than 5 years after its release. We have concluded that when we launch NWN:EE, it should be a brilliant game. And don’t forget - there’s no need to wait! 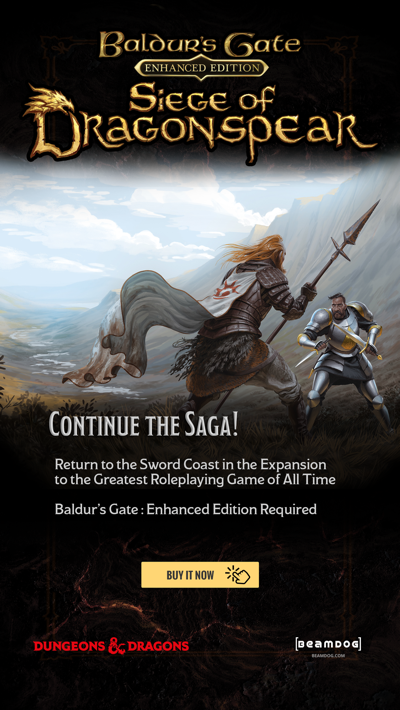 By getting the game on Beamdog you can start enjoying the Enhanced Edition right away, and then later get a key for Steam if you so desire. Your saves and progress will work on either platform! Beamdog title comes from “Beam” - “Transfer” and “Dog” - “Companion. So back in the day we wanted to be a digital platform to provide you with games and support for them. Phillip suggested “Lazercat” multiple times, but was shouted down at every turn. Regarding considering third party contracted developers (like the spots DLA and Ossian used to fill), - at the moment we have nothing official to announce. We liked what they did with the original game and agree - we would like to see more! We have an advisor from the NWNX group, who works with us on Neverwinter Nights: Enhanced Edition and has access to the code which will allow NWNX to become more powerful. While we want to do a new content and graphics for NWN:EE, we absolutely don’t want to break the old content. So we plan to do the new, improved graphics, for the new content. The goal is to make slow but steady progress, so that when we launch the game it will give a good experience to all the players. There’s still a lot of work left before we launch. Going forward, we plan to give you good value for spending money on Neverwinter Nights: Enhanced Edition. The discussion about unlocking new spellbook creation is big and we are still trying to find out how to handle it. In order to make sure we do everything right, we need to hear from you. So, go to the forums, reach some consensus, and we’ll start from there, moving the card from the Input board to the Roadmap board. Improvements on the Toolset is another big discussion. The Toolset is hard to work on. We have done some improvements on it, but at the moment the Toolset is not in active development. Additionally, we want to knock out high-value targets in the game itself before turning our attention to the Toolset. If enough people vote on it on the Input board, it’ll give us a boost! The chances of getting lowly voted features into NWN:EE depend on how easy they are to implement. For the most part, the voting will influence decisions. The Input board is a community endorsed thing. If the vast majority of our players think something is important, we’ll focus on it. With a potential modifying the 3.0 ruleset in NWN:EE, we have the same main rule: don’t change, - instead, unhardcode. We’ll open up servers and modding tools to let make changes, we don’t want to affect the backwards compatibility of NWN:EE. We like the idea of adding in the most popular tilesets created over the years for Neverwinter Nights (for example, a Medieval tileset) as base content for NWN:EE rather than having to add HAKs. But first we have to set up a contract to distribute these tilesets. It’ll come down to work with everyone who is responsible for them. The feature of adding a 4th class option for character multiclassing comes down to the UI. This feature (a 4th class option) is not at the top of the Input board currently, so if you want to ensure it happens, vote! The work on UI in NWN:EE is going to be a big job. A UI refactor and official controller support for Neverwinter Nights: Enhanced Edition are those things we’re definitely interested in. The team on original Neverwinter Nights never had time to do it, and for us it’s a question of when we can make it happen. The UI refactor will most likely happen earlier than the controller support. Phillip Daigle is very enthusiastic about adding the Steam Workshop for NWN:EE. In the same time, we don’t want to wreck the existing NWN Vault community and we’ll make sure people on Beamdog and GOG will have easy access to the same modules. Regarding something in the code that has caused us the biggest trouble in creating Neverwinter Nights: Enhanced Edition, - it’s the whole rendering pipeline. We burned it to the ground and started anew. Actually, we found problems in much of the code. Any time you work with a 13-years code base, you think that while this was pretty good for the graphics back in the day, it is not entirely the case today. Working on the Infinity Engine, we learned a lot. At his point, we’re probably at 70% of rewriting the whole code base for the Infinity Engine games. We usually talk with Wizards of the Coast at least once a week. We love to hear from them. Having a constant ongoing conversation is very positive for us. We commonly discuss everything with them – we pitch ideas to them, they pitch ideas to us. It’s a good relationship, providing a lot of feedback to what we are doing. WotC have been always so easy to work with. The people there are great. 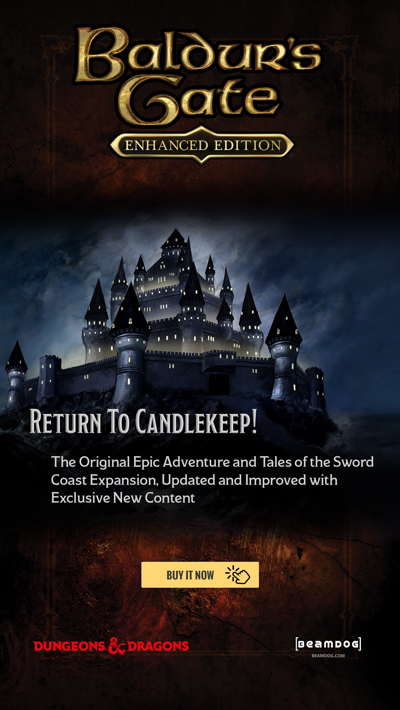 The 2.5 update for Baldur’s Gate: Enhanced Edition, Baldur’s Gate II: Enhanced Edition and Icewind Dale: Enhanced Edition is available on Google Play, Steam, and Beamdog, focused primarily on Multiplayer. Test the game and share your feedback in our Survey. After the holidays we’ll be pushing the 2.5 patch live on all the platforms. If we do a new D&D game, we’ll do it with the 5th Edition. There’re a lot of good things you remember from the 2nd and the 3rd Editions which are back with the 5th Edition. There’re a million and one stories we’re interested to tell in the Forgotten Realms. Today is the last day before we leave the office in 2017. We’ll be back in a couple of weeks. But don’t worry - there are people on our side who are constantly waiting for the bug reports you create from the 2.5 update open beta, and the earlier they hear about bugs, the better chances of fixing them will be. Report all the issues you find on Redmine. We wish all our players and fans Happy Holidays! Onwards to 2018! So, we're just now getting around to putting Medieval tilesets into a 10- to 15-year-old Medieval-Fantasy game? "What a crazy idea!" as Gilligan* said. *I'm 22 years old; I just happen to prefer old TV shows to new ones.